As some of you may recall, a few weeks ago I took to this very blog to air some of my grievances about the new season of Supernatural. In short, I was not impressed. But as the weeks passed, I have to admit to you all that I have changed my tune. The show recently celebrated it’s 200th episode, so let’s celebrate the show! If you’re all caught up, you’ll know that Dean is back (barring any surprise twist) in top notch human form, eager to get back to working cases with Sam just like the old days. Just what the doctor ordered! A call back to simpler times, when the brothers were rolling around in the Impala hunting the bad guys. Sam is skeptical that Dean is ready, but what else is new – it’s a classic Dean and Sam dynamic, one that I had been sorely missing. In line with this callback to the tone of earlier seasons, the show turned to past material that hasn’t lost any of it’s charm or excitement: a meta episode about teenage girls putting on a musical based on the work of Chuck Shurley/Carver Edlund, who working as prophet from Heaven, wrote a series of books called Supernatural, which chronicle the adventures of the Winchester brothers, adventures that the real-life audience already know because they match up to previous episodes in the series. It’s a slightly complicated web but one that pays off: As I have been saying to anyone who will listen (apologies go out to my friend Amanda, a fellow fan, to whom I am known to text random thoughts about the show), Supernatural is smart, witty, creative series that gets labeled as a cheesy melodrama about fairy tale creatures. The reality is, it’s a self-aware, funny, often sarcastic (mostly in form of snappy one-liners from Dean and later, Crowley) take on how to survive your family, and this 200th episode capitalized on the vastly underappreciated skills of it’s writers, creators, and actors, to simultaneously acknowledge how serious Supernatural is to it’s fans (the episode was called Fan Fiction, duh!) and how completely silly and not serious it is in the grand scheme – because let’s be real, it’s a cheesy melodrama about fairy tale creatures. One of my favorite things about Supernatural has always been it’s ability to laugh at itself. That attitude has always felt authentic to me, like a wink at the person watching through the screen. It uses the inherent cheesiness of the subject matter to the show’s advantage, to create something deeper, something that attempts to connect to the audience, rather than ignore it. 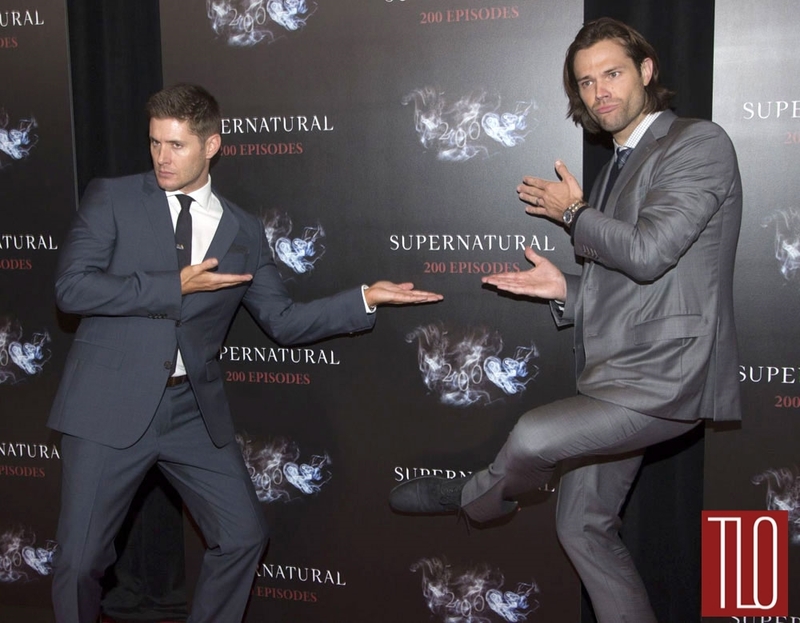 On the occasion of their (just passed) 200th episode, let’s take a moment to appreciate that Supernatural has survived this long for a reason: it’s a comedy dark horse, a lovingly crafted record of the power of family ties, and a self-aware spoof on the influence of a far-reaching fandom. Did you love the 200th episode? Let me know! Oh, and did anyone else catch that shot of a Clue board game in the scene where Dean goes into the secret attic in last week’s episode, “Ask Jeeves”? I used to be an avid watcher of SUPERNATURAL. I ended up dropping it for a bit, but I might pick it back up now. I always liked the characters-it just ran for so long and other shows happened.